To insert an image in your forumpost, you have to upload your image to a fileserver like fileden. I use picasa webalbum to get it done. 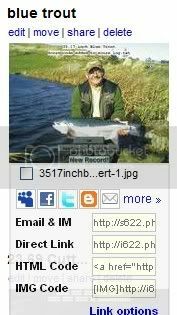 When uploaded, copy the url of your picture and create your post on the forum. When pressing the preview button (underneat the editor box) you can check the result. what do i doing wrong? Welcome to the forum. I have struggled with this problem before too. Here is what I do and this makes things simple. Go to http://www.Photobucket.com and create a free account. Save the picture you want to upload on your desktop, log into your Photobucket account and press "choose file". Locate and choose the file you want and it will be loaded. Copy the IMG code below the picture and paste it into your forum post which you have already started. And voila, it shows up in the post. I had lot of trouble trying to insert the url between the [img] and I found the above method more convenient as all you need to do is to copy the img url code and paste it. Hope this works for you. You can test this and show us a picture of a big smile, or a big fish! Good to see you up and running now! Welcome to the never ending friendly competition at RWFF. As it turns out, the process of inserting an image is easy and simple, if to follow certain recommendations. Thanks for helping out! I can't insert a picture here. Maybe you can help me? Every feedback will be useful for me. Thanks, guys!